You know the scenario. It has been a long week. 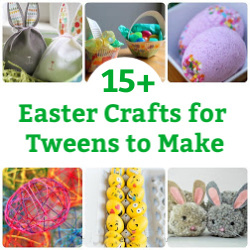 While you enjoy the summer heat, the weather has thrown your kids into a hot, sweaty frenzy. You have been surviving on popsicles and water…and more popsicles. It’s dinner time. 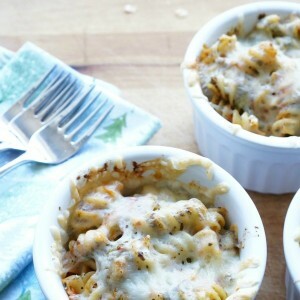 You need a quick, simple, hearty and healthy meal that everyone in your family will enjoy. 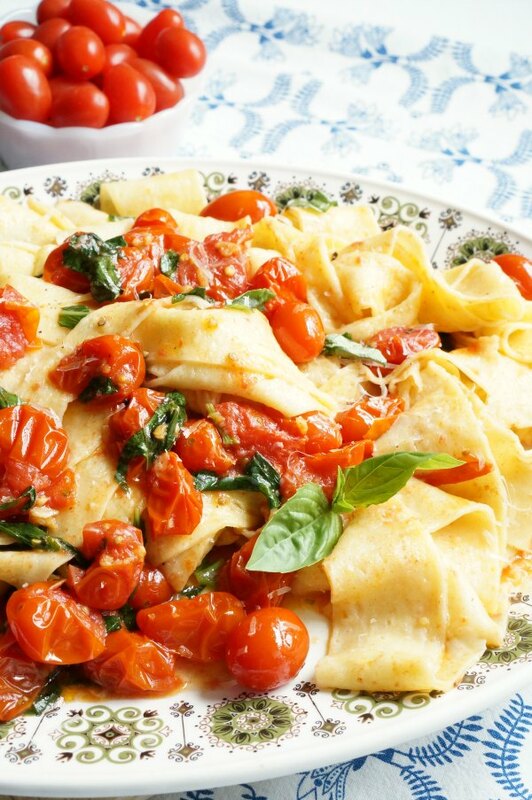 The answer is a plate full of homemade pappardelle with cherry tomato sauce. No fancy equipment required. 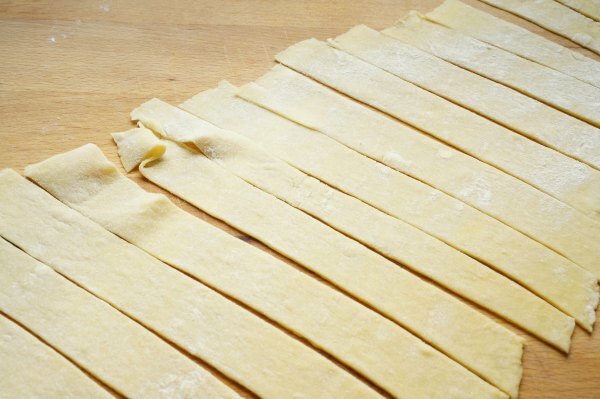 Pappardelle is a super basic pasta that can be made with a few ingredients and rolling pin. The sauce takes minutes to come together. This recipe will soon be a family favourite – for any time of the year. 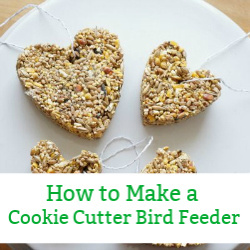 Pile the flour onto the counter. Create a well in the centre of the flour. Crack the eggs into the well of the flour. Don’t worry, the sides of the well will retain the eggs inside. Use a fork to gently beat the eggs. Using the fork, gradually shift the flour from the walls into the eggs. 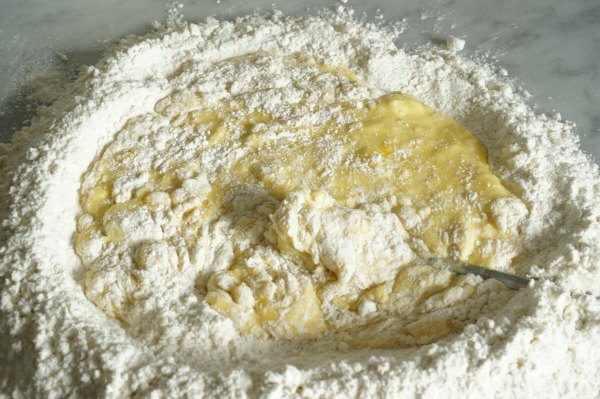 Continue bringing the flour into the eggs until a dough begins to form. 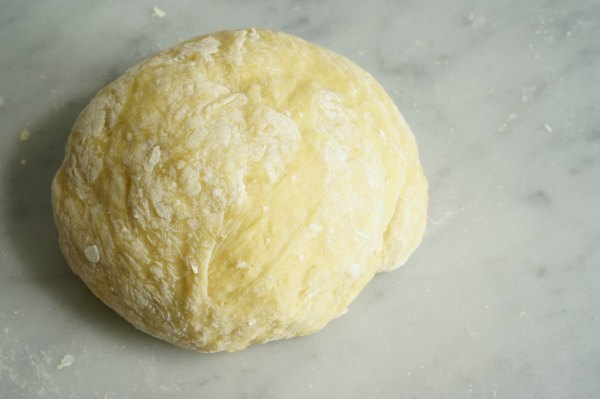 Knead the dough with your hands and continue adding flour until the dough is no longer sticky. Slice the dough into two equal portions, cover with a clean tea towel and let the it rest while starting the sauce. Warm olive oil in a large sauce pan, over medium heat. Add garlic and tomatoes to the warmed olive oil. As the tomatoes heat up some of them will pop open and others will wilt. When the tomatoes look nice and wilted toss in the chopped basil. On a lightly floured surface, roll one portion of the dough into a large rectangle. Roll the dough out until it is thin enough to see your hand through the dough. 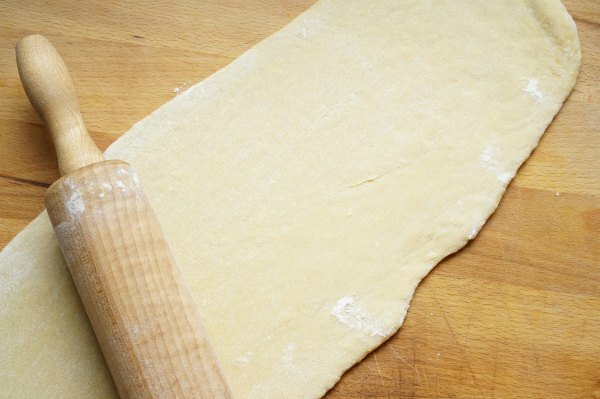 With a sharp knife, slice the dough into 3/4″ strips. Place pappardelle into a large pot of boiling, salted water and cook for 2-3 minutes. Remove cooked pasta from water and add directly to the sauce in the sauce pan. 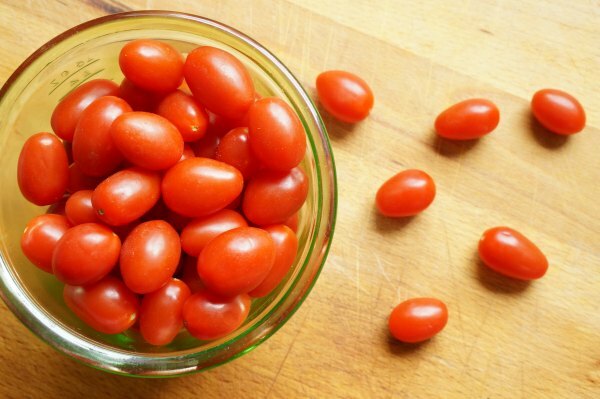 Toss with the cherry tomato sauce and serve. 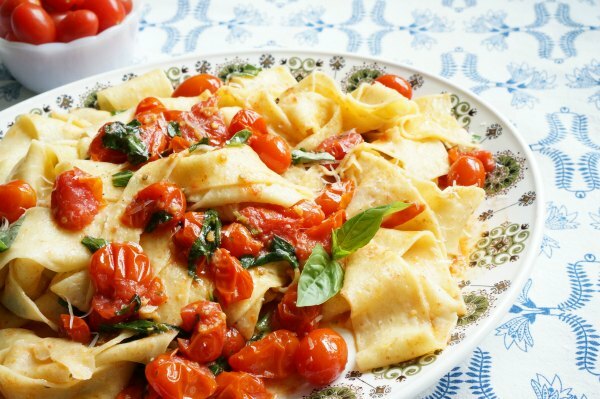 Homemade pappardelle is a super simple pasta to make at home. 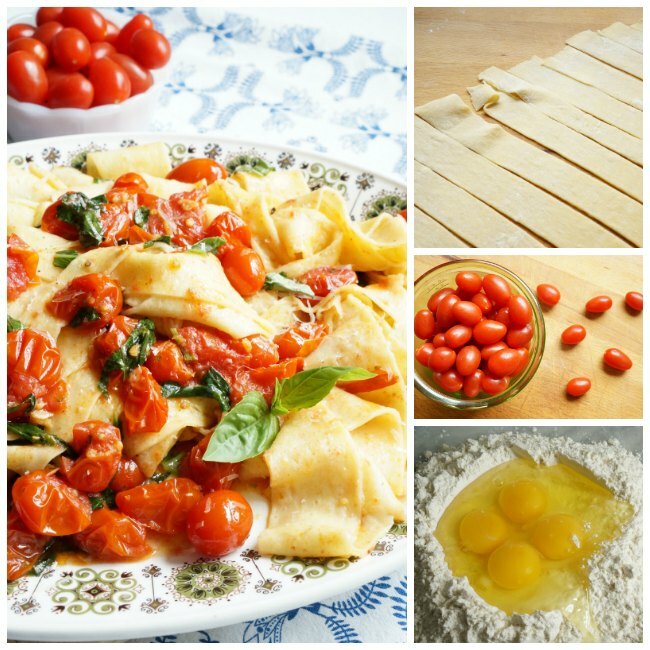 A simple recipe for homemade pappardelle with a sweet cherry tomato sauce. Crack the eggs into the well of the flour. Don't worry, the sides of the well will retain the eggs inside. Use a fork to gently beat the eggs. 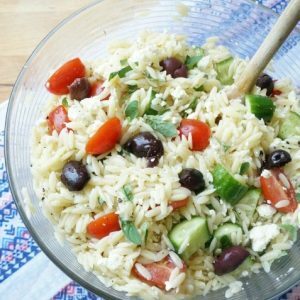 Today’s post is all about expanding the Food Revolution movement from one day to entire year of healthy, simple recipes for families to make and enjoy at home. Over the coming months I will be sharing my twist on chef Jamie Oliver’s 10 Food Revolution recipes. Last month, we kicked up a classic cheese omelette by adding a pile of fresh herbs from our kitchen garden. This month we are putting a homemade twist on Jamie Oliver’s basic spaghetti with tomato sauce. 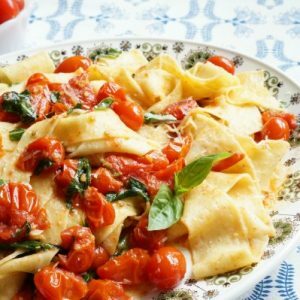 You don't need any fancy equipment to make this deliciously simple homemade pappardelle with cherry tomato sauce - a favourite recipe for busy families. With a sharp knife, slice the dough into 3/4" strips. Place pappardelle into a large pot of boiling, salted water and cook for 2-3 minutes. 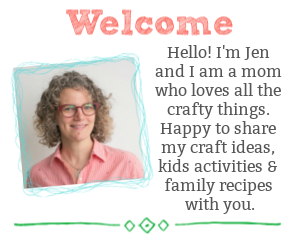 This looks lovely Jen! I need to up my homemade pasta game! Bookmarked!